This is something of a surprise. 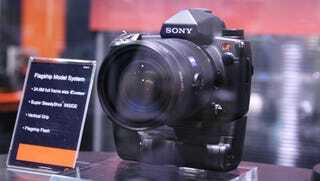 We sorta didn't expect Sony's 25-megapixel full-frame serious pro sensor to land in a Sony DSLR. The cam's details are scant as hell—it doesn't even have a name, just "flagship model system." All we could squeeze out of recalcitrant reps, other than what we already know about that sweet sensor, is that it's definitely an '08 release and has a 3.5-inch LCD that's got at least a megapixel of resolution (the a700's screen was name-checked), plus it has built-in image stabilization. Since it's so prelim, no other specs, price or more definitive release date. Looks like the D3 and EOS-1Ds Mark III might have some new competition.